Here's what I have started on the vest so far. This is the left side of the back or front (both are worked exactly alike). That's the shoulder and armhole there. It looks sort of weird, but I guess it looks pretty much the same as the photo. 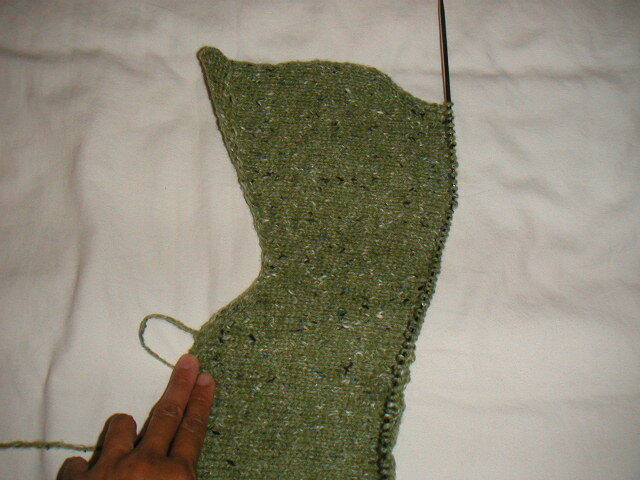 I really like knitting with the felted tweed, though my fingers sometimes get sweaty. The fabric feels very nice and soft and I like the flecks of colors in the yarn. I will need to buy some shirts from the new American Apparel (just opened last week!) to wear underneath. PS Click here to see what I was working on the last five days.